18" x 18" 18" x 16" 16" x 16"
Have you been dreaming of that unique custom wheelchair that would not cost you an arm and a leg? Have Faith. Colours has answered your prayers with the fully adjustable SPAZZ-G ultra-lightweight wheelchair. Now not only can you have a totally adjustable stylish wheelchair, but with a MSRP of only $1,550.00 (as configured) you can kiss your out of pocket expenses goodbye. Let’s not forget the SPAZZ-G has a main rigid axle tube that gives you the durability, rigidity and support that you depend on from your wheelchair frame. The SPAZZ-G features not only growth seat width and depth, but Colours also offers adjustable positioning for every unique body. And with the SPAZZ-G unique contoured frame you will never again have to worry about loading your wheelchair over your steering wheel. With the SPAZZ-G positive locking adjustable backrest, you will benefit from its full range of infinite backrest angle settings. Now you can truly find your perfect sweet spot to set your backrest angle. 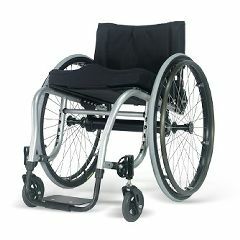 Backrest: Angle & Height Adjustable, 9" -12"
Adjustable Seat Options: The seat width can be adjusted about a 1/2" without needing additional parts. If you need to adjust further, a wider seat sling and backrest upholstery may be needed. The Depth can be adjusted about an 1" before the same parts will be required. SpazzG_18x18 - 18" x 18"
SpazzG_18x16 - 18" x 16"
SpazzG_16x16 - 16" x 16"
"...that would not cost you an arm and a leg." Really. Is the foot rest adjustable?? Seems pretty low and would like it higher.